How Are You Handling Anxiety And Depression? How are you handling anxiety and depression? 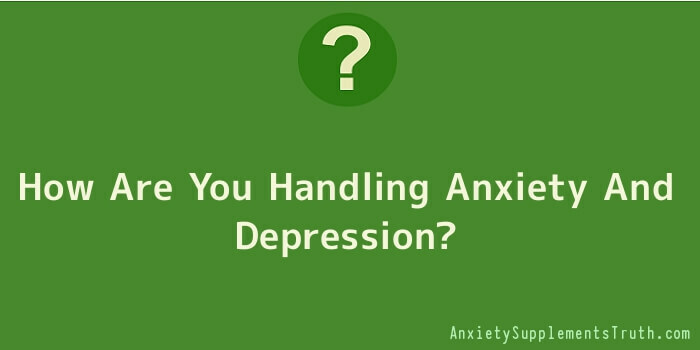 Many who suffer from anxiety and depression take medication to relieve their pain. Doctors may prescribe antidepressants, tranquillizers and sleeping tablets for your condition. But there are healthier alternatives that can be used in attacking anxiety and depression. Exercise is extremely important for many reasons but even more so if you suffer from anxiety and depression. Many of you will say that you just don’t have the time to exercise. But exercising doesn’t have to be done in a gym or health club. It can be a 20 minute walk around your neighbourhood or running up and down your stairs. Among other things, regular exercise increases your endorphins, those happy hormones that get the good feelings going in your body. They boost self-esteem, and reduce the symptoms of depression, anxiety and stress. The catch is that you need to exercise regularly to benefit from it. Set up a schedule and stick to it. If you can’t do 20 minutes every day, try it three or four times per week. And make sure you do something that gets your heart rate up a little bit. Once you get the hang of it, you’ll start to feel better and will look forward to your little exercise break. Social support is crucial during tough times and especially if you’re attacking anxiety and depression. It’s probable that you want to just be alone when you feel depressed. But try to keep in mind that loneliness is actually one of the causes of depression, and if you already have it, sitting alone could worsen the situation. So think about getting involved in some groups, even if it’s the last thing you want to do. You can start by volunteering. Doing something for others is a great way to feel better about yourself and humanity, and it takes your mind off of how bad you may believe things are. Similarly, talking to someone about how you feel is a great way to alleviate some of your pain. You don’t need to go out and join a group to do this. Share how you feel with a close family member, friend or even a professional who will lend an objective ear. Relaxation and meditation are also very effective when it comes to treating depression. One of the best methods of relaxation is to practice savasana (referred to as the “dead body pose”). In this position, you lie flat on your back with your arms relaxed at your sides. This is a position that is often done between yoga exercises. It returns blood circulation to normal and teaches complete relaxation. Take certain supplements. There is a strong correlation between anxiety/panic disorder and low levels of certain vitamins and minerals. Here are some things that you want to make sure you are getting enough of: Omega 3 fish oil, calcium, magnesium, and vitamin c and b-complex vitamin supplements.